One of the most exciting things about looking forward to a new year is anticipating the new design trends that will impact the industry in the months to come. Our recent project with CSG International let us explore some of these trends ahead of time. A renowned business support solutions provider, CSG is a company well accustomed to handling change. They pride themselves on helping communications and media service providers predict market changes and stay one step ahead. 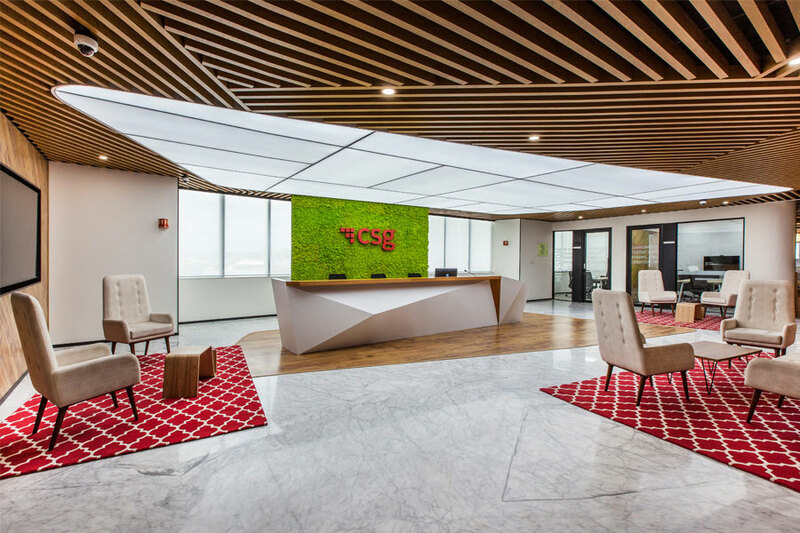 With a company vision that stretches far into the future and solutions that follow close behind, CSG’s new office had to be avant-garde. Companies are already moving away from purely functional spaces that prioritise productivity above all else. Creative output happens best when the mind is relaxed, so firms are shifting focus to employees’ comfort and mental well-being. In 2019, we foresee the workplace getting cosier and more hygge-like than ever before. The CSG recreation area is a prime example of wellness-inspired design. Airy and well-lit, the room is filled with cosy sofas and chairs. There are wide-screen televisions for colleagues to gather around to enjoy matches and live events. People can grab a quick bite at the Coffee and Chai Zones – each designed with a unique look and feel, and each equipped with state-of-the-art café apparatus. 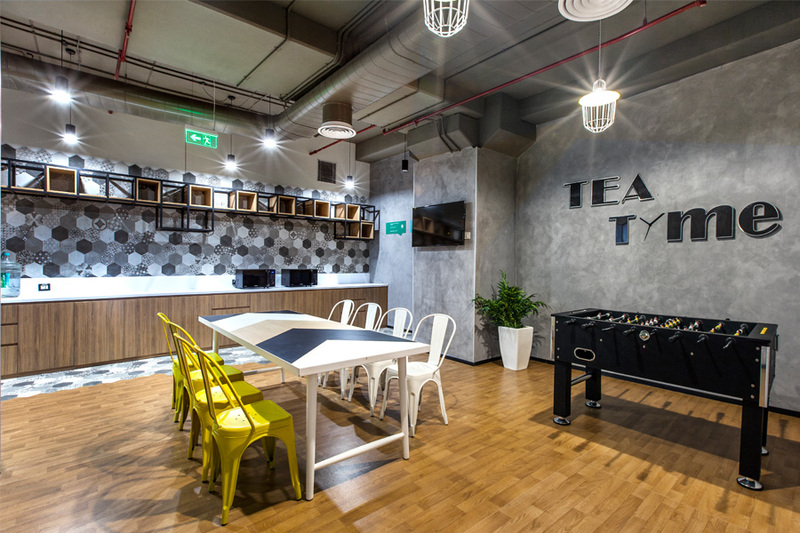 Those looking for some activity can head to the other side of the room for a round of foosball, mini cricket or mini football with their co-workers. The work areas too, have lots of little nooks to which one can retreat if they want a break from their desks. Cosy corners are made more inviting with plush sofas, low stools, colourful cushions and soothing artwork. 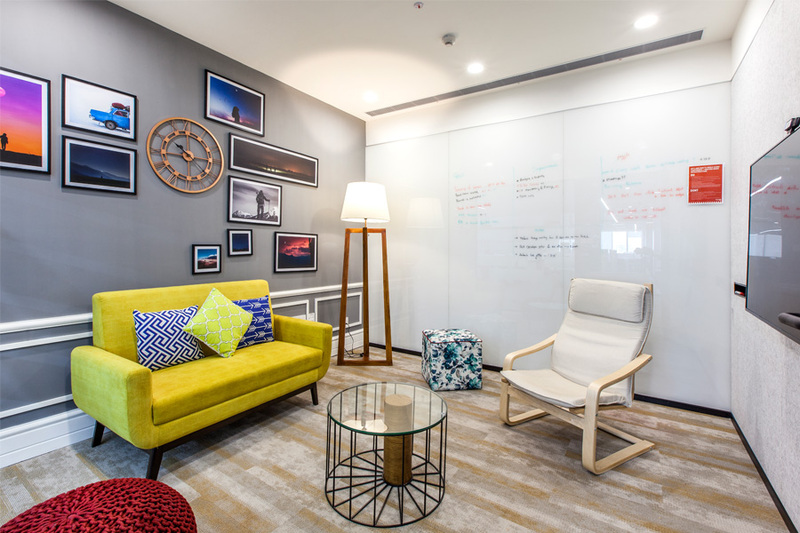 Employees can curl up near wall-to-wall windows – add a cup of coffee and a mellow playlist, and they are all set for an hour or two of focussed work. Rather than attempting to power through a particularly unproductive afternoon slump, people are encouraged to head to the specially designed nap rooms. A power nap of just 20 minutes is enough to help them reset and refocus on the task at hand. Open offices have been around for a while now, thanks to the rise of coworking spaces over the last few years. However, 2019 will see open offices get more strategic than ever before. Rather than large, undefined spaces, offices are opting for multi-use areas that can be opened up or sectioned off as needed. In order to accommodate the activity-based working style of the CSG workforce, their office is divided into multi-use ‘zones’. Based on their functions, each zone is marked out by different flooring patterns, and ceiling and wall designs. One major update from the previous years is the attention given to collaboration areas. Open spaces are great for collaborative work – but not if there are several teams trying to brainstorm in the same area. So for CSG, we created several informal meeting rooms, hot desks, phone booths and training rooms. These rooms have adequate writing surfaces and light, movable furniture to enable flexible work days, while still offering privacy and solitude for focussed work. Biophilia is the human desire to connect with nature and to draw comfort from green spaces. When this desire is denied (as is often the case for people with desk jobs), employees report feeling ill, fatigued and stressed. In response to this, companies are opting for natural, green spaces within their buildings. 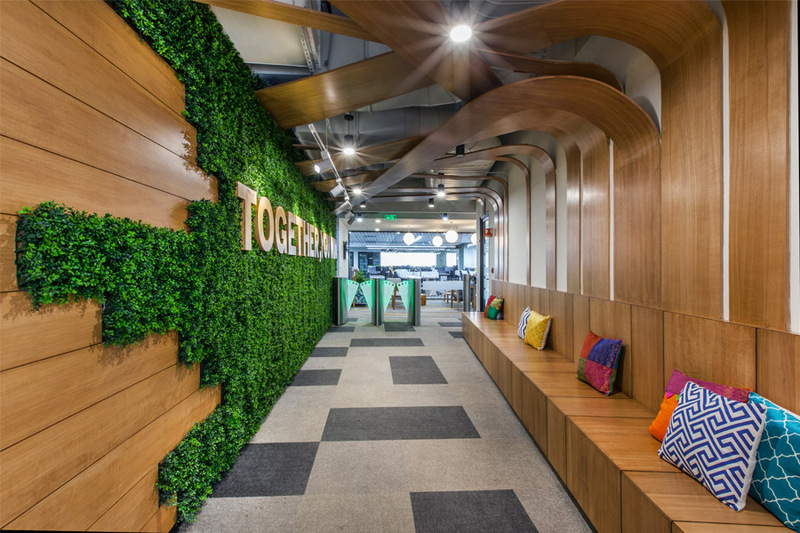 Come 2019, biophilic design will be less of a trend and more of a necessity in people-centric workplaces. Futuristic offices will incorporate greenery right into the architecture of their buildings, and mimic nature as closely as possible when it comes to light, sound, smells and thermal conditions. In this regard, the new CSG office is indeed one step ahead. The reception area is done up with wooden wall panels that swoop across the ceiling to give a natural, canopy-like effect. Above this canopy are skylights covered with special stretch fabric that provides protection while letting in sunlight. The luxurious moss wall along the corridor is the pièce de résistance. Moss walls are a cost-effective, manageable update on the green walls that rose in popularity in 2018. Stark minimalism is fast being replaced by earthy touches that give a space a cheerful, lived-in look. Sleek spaces are juxtaposed with aged, distressed textures that are sure to have their moment in 2019. Walking through the CSG office, one notices many examples of such earthy elements. Wood beams and exposed ducts on the ceiling give each room an interesting character. One of the meeting areas is sectioned off from the work zone with a twisted rope partition, which imparts a rustic charm to the whole space. 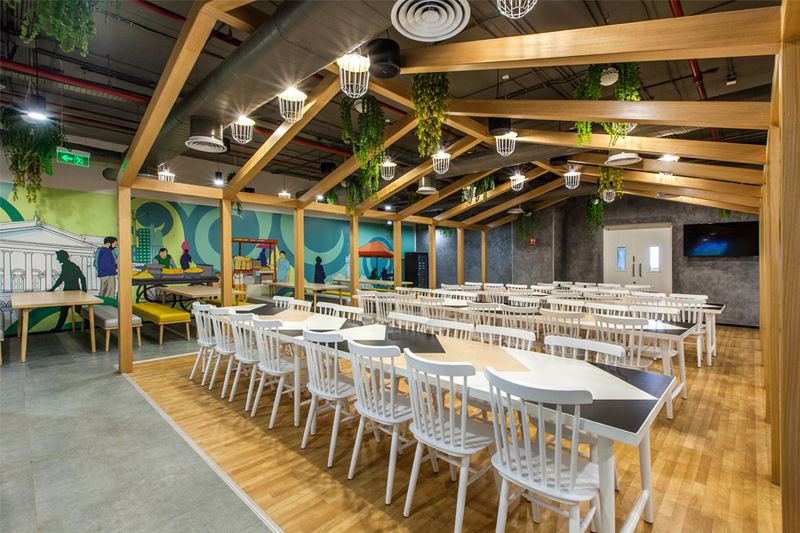 The cafeteria features a mural showcasing city scenes reminiscent of an old-world Bangalore. Even the chairs and glass-topped tables are given textural intrigue with distressed wood and jute accents. Sourced from local artisans, they give a traditional flavour to this otherwise modern office. Plain, solid coloured interiors are going out of favour as designers lean towards eye-catching patterns and geometric shapes to create visual interest. Sitting at the Coffee and Tea Zones at the CSG office, one will notice hexagonal patterns on the wall and counters. In certain spots, these patterns extend horizontally, over on the floor, giving this area a chic, multi-dimensional depth. Such geometrical elements make an appearance all over the office interiors. 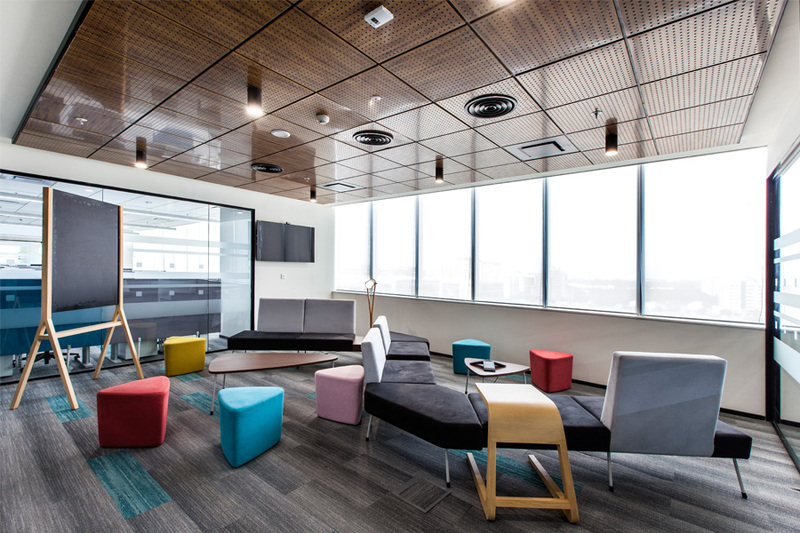 Look out for the patterned cushions on the sofas, the bright, triangular stools in the collaboration areas, and the striking photo frames on the wall. If you are looking for a design partner to help you conceptualise a forward-thinking workplace strategy, get in touch with us.